If it's just desks, drawers and chairs your are looking for, let Mardel Office Interiors Ltd design your office, then supply, build and install as per plan your new office furniture. 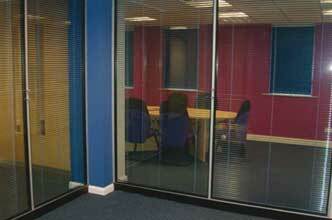 We can accommodate most delivery time frames, with a team of experienced fitters. 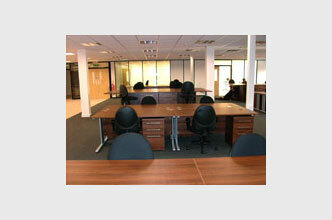 We can be in and out leaving nothing but your new office furniture ready to use in next to no time at all. For displaying products to new customers and holding meetings to discuss new lines, our customer wanted to convert some office of their offices into a spacious meeting room. 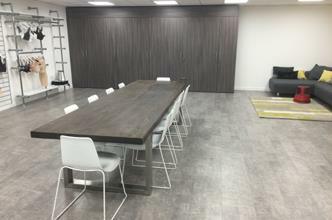 Starting by ripping out an old wall, Mardel built a glass wall complete with central doors, then fitted wardrobes and storage cupboards, lastly we installed a one piece 3.5 metre long rustic meeting table to complete the job and all on the second floor of the building. A brand new call centre for 35 staff planned, supplied and installed within budget and on time complete with new ceiling, flooring, decoration (including central feature wall), desking, storage and seating. Crystal Martin International chose Mardel Office Interiors to completely revamp their reception area that had become old and dated. 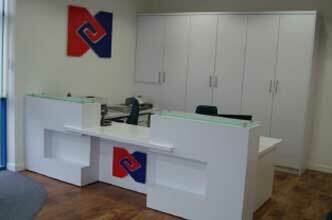 Two receptionists are required to work behind the counter and space had become a premium, things required a change. Mardels' design team created a bespoke new reception counter, along with matching storage cabinets and a new beverage vending area. 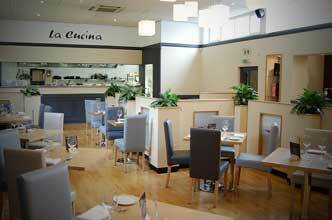 New flooring was laid to create area definition and finished off with designer seating and tables. Mardel were tasked by WLR Prototype Engineers to carry out a full refurbishment of their new premises at Wilford, Nottingham. They wanted an open plan feel which was both contemporary yet functional. The building was in need of a serious refurbishment in order to bring it in line with a modern and forward looking company. Internal walls were removed and a new more suitable layout was designed. Motorpoint, the successful national car dealership, chose Mardel to fit out their new sales area at Derby’s head office showroom. With the focus firmly on achieving a modern bright style to welcome customers, Mardel worked closely with Motorpoint to develop the right look. 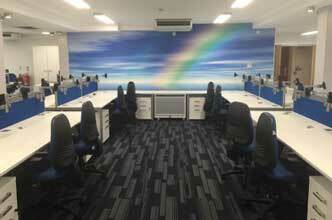 Fresh fabric colours complimented perfectly the light ash desks and Karndean flooring. With the choice of chrome finishing throughout and polycarbonate translucent screens to provide individual client privacy the whole area development provides a fresh and invigorating environment for both Motorpoint staff and visitors. In addition to the furniture supplied, Mardel also project managed the suspended ceiling, office partitioning and flooring requirements. 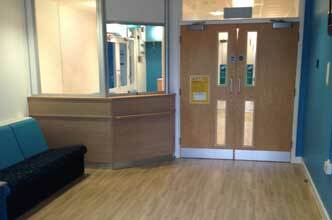 This was followed by a series of time managed installations to replace all rear of house furniture with minimal disruption to staff. 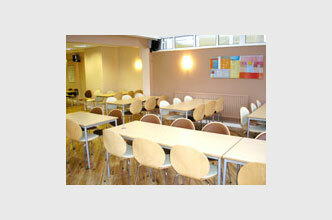 EEF Barleythorpe Training & Conference Centre near Oakham have upgraded their restaurant facilities. A contemporary fresh look was required but with practical elements included such as different sized tables to allow a flexible approach to layouts. Mardel suggested a number of options, the final choice offering the required flexibility and occupancy level stipulated by the client. Table tops were chosen in hard wearing Formica complimented by café style steamed beech chairs with vinyl padded seats and backs. 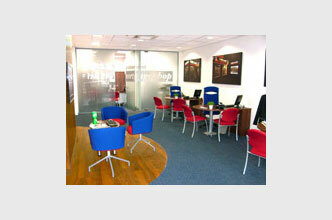 David James Estate Agents of Nottingham have expanded with a new branch in the busy Beeston suburb of the city. Mardel were asked to provide a range of furniture that would meet precise performance requirements yet offer great visual appearance. Bespoke designed conference style desks were supplied to allow both staff and customers easy access to the monitor screen to view available properties. Fitted drawers were built into the desks to provide both general storage and to hide cpu’s and cables for a clean, tidy appearance. A walnut and silver trim finish was chosen. The waiting area seating from Edge Design’s Harmony range in a two tone colour scheme offers superb comfort and modern design. Mansfield based clothing manufacturer Crystal Martin approached Mardel for a new furniture fit out in their ladies wear design section. 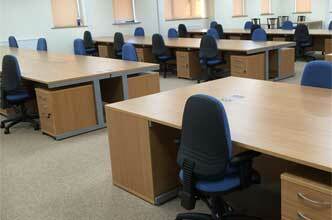 A total of eighty staff required desks set out to a very specific layout. 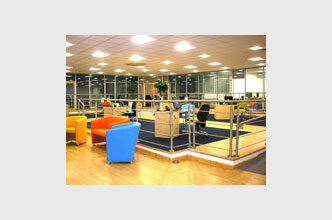 In addition, bespoke tables were designed where staff work with fabric and clothing ranges. Each table was designed to provide lockable storage, fabric roll storage and a clothing rail. There is a heavy demand for storage capacity in this area. Mardel fitted bespoke floor to ceiling storage wall with each unit individually specified with appropriate internal fittings. A contemporary walnut and white finish was chose.